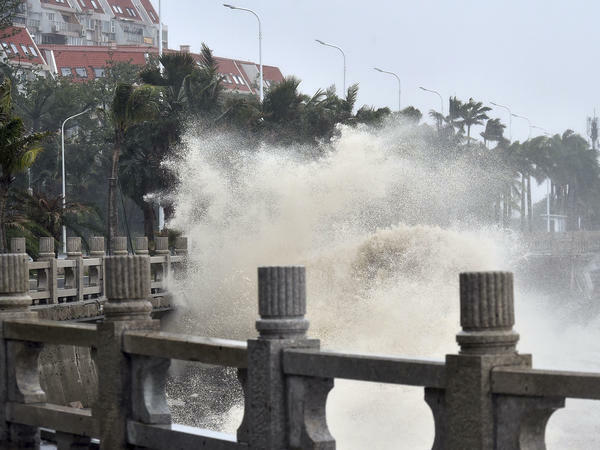 In the grips of Typhoon Mangkhut on Sunday, waves crashed against the coastline in Zhuhai, southern China's Guangdong province. The storm has torn through the Philippines, Hong Kong and Macau. As the typhoon approached the Pearl River Delta, the country's National Observatory issued its highest alert level. Hundreds of flights were canceled. Thousands of fishing boats were called back to port. And more than 2.4 million people were relocated, according to the AP. In Hong Kong, videos posted to social media showed buildings swaying, roofs torn off, scaffolding collapsing and windows blown out by fierce winds. Gusts of winds reached up to 127 miles per hour, NPR's Rob Schmitz reported, sending debris flying. On flooded streets that resembled rivers, some residents traveled by canoe. Waves along the Hong Kong coastline reached as high as 40 feet, according to The New York Times. Authorities were preparing to protect two nuclear plants, Taishan and Yangjiang along the coastline. "All emergency duty personnel of Taishan Nuclear Power have been on the job, all preparations have been implemented, and the Taishan Nuclear Power Base is ready," managers said in a statement, according to the Times. After the typhoon hit Macau, 15 people were reported injured and 20,000 households lost power, according to the South China Morning Post. Electricity supplier Companhia de Electricidade de Macau said it suspended power to low-lying areas and will return it when the water level recedes. Yaonan Li, a resident in downtown Zhuhai, some 15 minutes outside Macau, told NPR the government was nervous about the typhoon but had learned its lesson from a typhoon last year. "The Zhuhai city government spent the financial subsidy that they received from the central government last year on rebuilding the city," paving new roads and reinforcing sidewalks, he said. The government announced the closure of its bustling casinos, heritage sites and museums. Schools will be suspended for a day, the South China Morning Post reported. Mangkhut arrived in China after making landfall Saturday morning on Luzon, the largest island in the Philippines. With sustained winds of more than 120 mph, it was stronger than Hurricane Florence when it made landfall with the Carolinas. Dozens of people have died and more are feared to be trapped by landslides, especially in the Cordillera mountain region. Philippines President Rodrigo Duterte traveled to Cagayan province Sunday to assess the damage and recovery efforts. "I share the grief of those who lost loved ones," he said, calling it "an act of God," according to the Philippine News Agency. He also said he was "very, very satisfied" with the government's overall response. The National Food Authority planned to release nearly 5,000 bags of rice to relief agencies and local government units, the Philippine Information Agency stated. The Philippine Red Cross shared video and images of rescue efforts, including a nighttime search for families in "neck deep floods." The ceiling of a district hospital, "leaving the emergency room, laboratory, Out Patient Department, terrace and lobby unusable," it said. The military planned to send two C-130 airplanes and 10 helicopters for relief and rescue operations, according to CNN. By 8 p.m. local time in China, the Hong Kong Observatory said winds had weakened. It downgraded its warning level for the typhoon. "As gales and violent squalls are still occurring in places, precautions should not yet be relaxed," it added. Mangkhut is expected to move west over northern Vietnam.